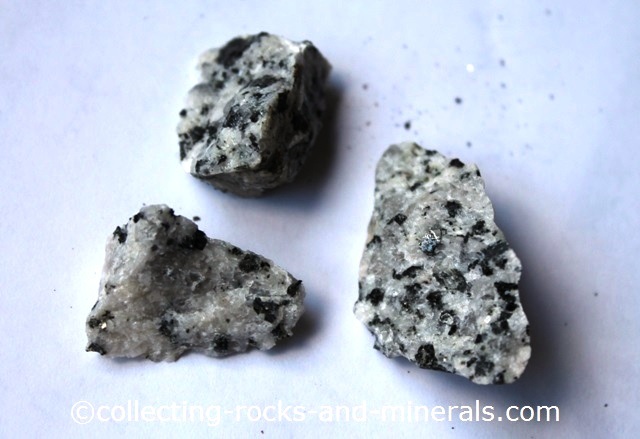 On this page you have the information on igneous rocks. Their name comes from ignis, Latin for fire. This is because the only time we see them to form is when lava - and fire, come out of volcanoes. The rest of that rock is formed from molten magma under the Earth's surface. These, sometimes called volcanic rocks, are very, very common. They cover almost all of the Earth's oceanic crust, because basalt is formed where magma comes out from the mid-oceanic ridges. And they cover much of the continental crust, where granite - one of the commonest rocks on the Earth, is only one example. Granite and basalt represent two different types of igneous rocks - extrusive and intrusive. The intrusives, such as granite, are formed under the Earth's surface. The extrusives, such as basalt, form above the Earth's surface, as lava freezes when it cools. The size of mineral grain tells how quick the cooling has been. When the cooling is slow, which it is deep down under the surface, igneous minerals have long time to grow and they are large and well formed. When cooling is quick, the minerals are small and not very well formed. Intrusive rocks include granite, diorite, gabbro, dolerite and many others. Extrusive rocks include rhyolite, andesite, dacite, basalt, obsidian and others. Tuff is a pyroclastic rock. Pegmatite is not a porphyritic rock. Lava rocks can be formed either from shield volcanoes or stratovolcanoes.